A common sentence I hear from my fellow testers especially when I ask how they keep themselves updated and how they learn about a new technologies are “I don’t have time after work”, “I don’t take work to home”, “I do my work and go home and relax”, or “after work is time to relax or have fun, not to learn”. 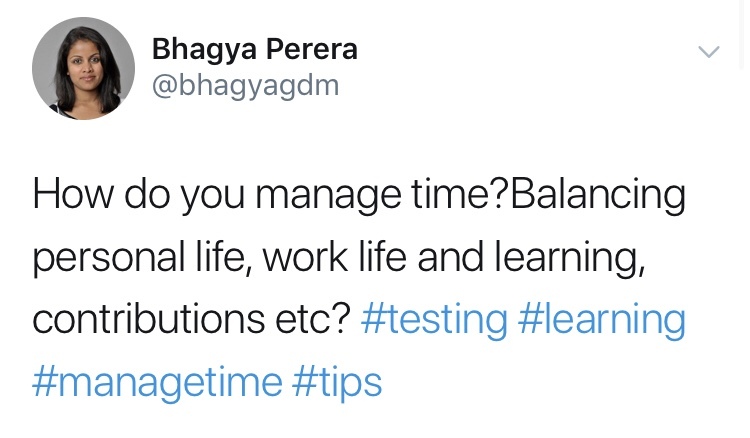 In the same time, there are many testers I know who are out there learning, managing work, and managing personal life and then also share their knowledge with others via blogs, webinars, conferences etc. If you are person who do not like to spend your personal time on learning, keep updated with the outside world from your office, then this post may not for you. If you are seeking ways to keep up, then welcome! What’s the secret of being relevant? I have started a Twitter conversation asking the same question. No one method is the same. What works for you will not work for another. Individual experience, priorities and interests is playing a big part. I have received some fantastic responses, which you may find helpful. I totally agree. No one can force you to learn unless you really want to do it so. If you really want to do it, then you will find the time that you don’t have. Balancing the work and learning will come naturally. And also, not many people think we learn at work but we do. I can relate to Anna’s response. I share me between being a mom, work as well as a house wife. I am fulfilling the expectations of a being those roles as best as I can as many woman out there. Finding time to read a blog is sometimes is hard. However I am sure finding a “me” time is not that hard if that’s your priority. I know many people read on the train, listen to podcasts while they run or while you are working out in a gym, read blogs while you are waiting for a meeting to start, using lunch hour to keep themselves updated, join webinars or go to meetups. There are wide variety of options and possibilities. It’s up to you to find out what is best for you and your commitments. Thanks Bill. Above is great advice. I know sometimes I can go in to a rabbit hole when I want to learn about something and get lost on it. Or I get really overwhelmed by the amount of resources I have to refer or by the amount of new things that is out there for me to learn. I am sure there are people out there who can relate to this. I really have to start practising above. May be I can share my experience on a later post. Sometimes I am in a dilemma on what to learn – especially with technology that is out there. Some technologies I have to learn to proceed with work vs the technologies out there that I am interested. Investing work time on work related and invest personal time for the things I like to learn? But that is not always practical isn’t it? At work, I have weeks that nothing but meetings. Sometimes I block my diary to get some time reserved for me but that is not working with all the priorities, broken builds and “we really need your input on this”. I always struggle with investing my time to learn technologies. Sometimes I take my laptop out after my kid go to sleep and we have dinner to do some experiments. I know it doesn’t work for everyone but it’s an option. The above is a fine way to conclude this. The passion should come from you, your priorities. You always can make it interesting as Neil mentioned. You may feel that your manager has the responsibility to sort out your learning. It’s like you wait your manager to sort out your career as well. I have heard people telling their managers “you didn’t help me learn or help me develop”. Every story have two sides yes but if you want to learn something, why you have to wait until your manager sort that out for you? It all depends on what you want to do? Do you want to build yourself, be relevant and be the drive for your career and knowledge? Then I think the above conversation may help you.